Well I did it. I went to my very first flea market! And let me tell you, it wasn't as cute as all you fabulous vendors I follow in blogland make your booths look. It was a parade of junk ... but of course I didn't mind. That's the fun of it! The hunt. The search for treasure ... and a bargain. It's just too much fun! And treasure I found. Not so much bargains, but treasure none the less! My sister and I headed to the only real flea market I could find via Google. (If anyone knows of anything else around Wichita, let me know!) It meets on the third Sunday each month at the Kansas Coliseum. I have to say I was pretty proud of myself knowing what things were and what the hot collections were right now (many thanks to everyone in blogland for teaching me : ). There were lots of vintage flower frogs ... I don't collect them but fun to look at! There was also a collection of vintage shaving brushes like in Flea Market Style mag. I fell HARD for a vintage clock face, all white with black roman numerals. Only problem was, the guy wanted $35 for it. Sorry buddy, I could buy a new clock and take out the face for that! This great old chippy window for just $8. Plus an assortment of vintage numbers, vintage sign letters that spell "honey" (obviously : ) and a great old wire filing basket. The basket was $10, which I thought was a little pricey. But one of the must-buys on my list was a wire basket, and all of them were even more expensive than this. Plus I liked the shape, depth and patina on it. The window I hung behind my TV display. Sorry for the ugly black TV ... but I had to spruce up that space somehow! I've had this display for a while and I won't even tell you what was behind there before. (Think half-finished vinyl wall phrases ... yikes.) I think this completes the look nicely. The shelf you've seen before and is a $3 Goodwill find, the apothecary jar is from Home Goods (oh, to have one in Wichita! ), the little pot is from TJ Maxx, the tall metal holder is from some fun shop in Mississippi and I bought it when I was probably about 13 (I've always had good taste I guess : ). The dried roses are from my parents the day I was initiated into Delta Gamma. They're looking a little sad now, and I've wanted to replace them with gorgeous lavender stems from Hobby Lobby, but I guess the money tree I planted out back isn't growing too well. The warmer is Scentsy from my BFF. Nest is from Hobby Lobby and eggs are from my fave boutique here in town, Lucinda's. Whew! Was that way too much detail? I always love knowing where everyone got their vignette pieces from, so I thought I'd share! I also nailed some of the old numbers into the window for a fun touch. Since there seem to be no number pieces available around here, I'll just make my own! The wire tray went into my little potting shelf in the kitchen and holds tea towels and two of my cake stands. I also tied some of the numbers on with raffia. I think it looks pretty cute! It may eventually migrate to my office, but we'll see. Here's the whole thing, minus the top. It's a little busy/random right now, but I'm always playing with it. And last but not least, I stuck the honey sign above the doors to my laundry closet. Definitely not the best space for it (too small up there!) but I haven't found just the right spot yet. I'm sure it will find a home eventually. I also scored this gorgeous vintage scale off of eBay this weekend! Yay! I had been outbid on several before, and I'm glad now because this green is the exact one I use in my kitchen. I'll show it to you in its new home in my (rapidly filling!) kitchen. Well, that's it for my flea market finds ... and my budget for this month. I'll just have to show you stuff I've done for free around my house, because I'm all shopped/spent out! : ) More to come soon! Today I'm linking to the Thrifty Treasures party over on Southern Hospitality. And also the old windows party on Funky Junk Interiors. Enjoy! Love it! :) A word to the wise, I wouldn't suggest the flea market on south Meridian. Scaryville doesn't seem to do it justice :/ And I didn't find any treasures. It has obviously changed since my mom has been there years ago since she's the one who suggested it ;) Thanks for the info about the one at the Coliseum! You're so cute! Look at all the wonderful treasures you found - can't wait until we hit up some garages sales and flea markets together! Just thought I'd let you know that we do have one galvanized pedestal in stock, so let me know if you run into any problems. We'll be getting more in a week or so. Enjoy your day! Congrats on your 1st flea market trip! Are you hooked? They do have great stuff if you're willing to search. 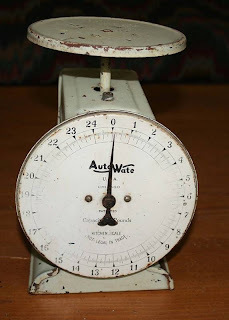 I have the same scale in a darker green that belonged to my grandparents. Love the window and basket. Great old window and a great price. I really like the old wire basket too! Cute window placement! I like how it just adds some texture without darkening the area. Very nice! Thanks for linking up to Old Windows SNS! I like your window and the placement of it. Takes away and distracts from the TV-- I have mine placed next to my TV as well... don't we love to hate 'em; but everybody's got one. So you have to decorate around it. I happen to like your wire filing tray too. I like what you did with all your goodies! That is such a lovely vignette! I'm absolutely going to have to find an old window (AND a place to put it! Beautiful!